Winter was always a slow season for beach communities. The winter of 1913-14 was exceptionally severe, with terrible storms. Land sales in Seal Beach and all of Southern California took a deep dive when heavy rains and extensive flooding put a damper on the real estate market. An unbelievable 6.64 inches of rain fell between January 15-19, 1914---this was indeed remarkable when the average yearly rainfall for the region was 14.98 inches! 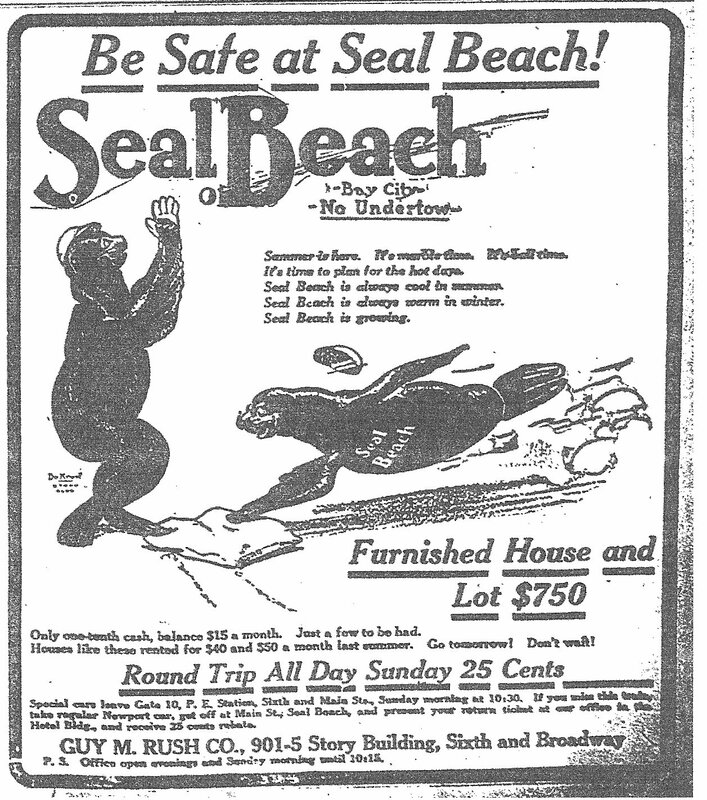 Despite the weather, one Seal Beach ad did appear in January. Promoters had hired a special train scheduled to leave Los Angeles at 10:30 a.m. to bring visitors to the shore. It was hoped that the rain would stop and there would indeed be a "spring like" day at Seal Beach. "It's spring at Seal Beach! The wind is balmy at Seal Beach. The tides are tame at Seal Beach. It's shirt sleeve time at the beach without an undertow. New homes - new buildings - improvements are being made every day at Seal Beach. Don't fail to visit Seal Beach Sunday." 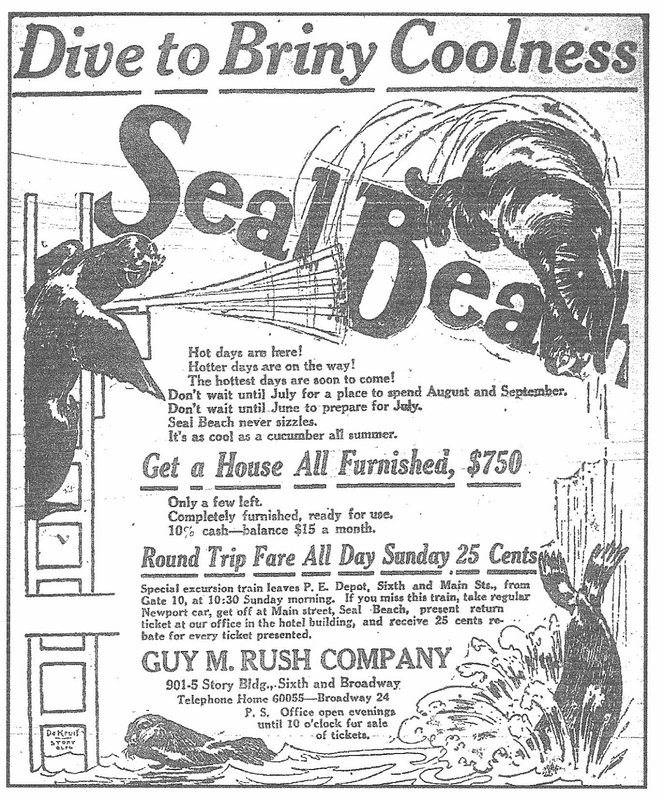 To let prospective buyers know that Seal Beach would continue, despite the floods, an article about Seal Beach's "commitment" to its residents, and future, appeared the same day as the ad. By a unanimous vote, the citizens of Seal Beach on Tuesday decided to accept the $6000 tract of land offered them by the Guy M. Rush Company and the Bayside Land Company as a site for a school building. The offer to the citizens was made with the understanding that they would add a like amount to their appropriation for building purposes, making a total of $12,000 available for the proposed structure. Situated between Eleventh and Twelfth streets, within two blocks of the ocean and close to the car line, the acre site of the new school is practically in the center of the populated district of Seal Beach. The structure is to be modern in every respect with every convenience needed for the comfort of the pupil. It is to be constructed of brick and cement and will have a tile roof. 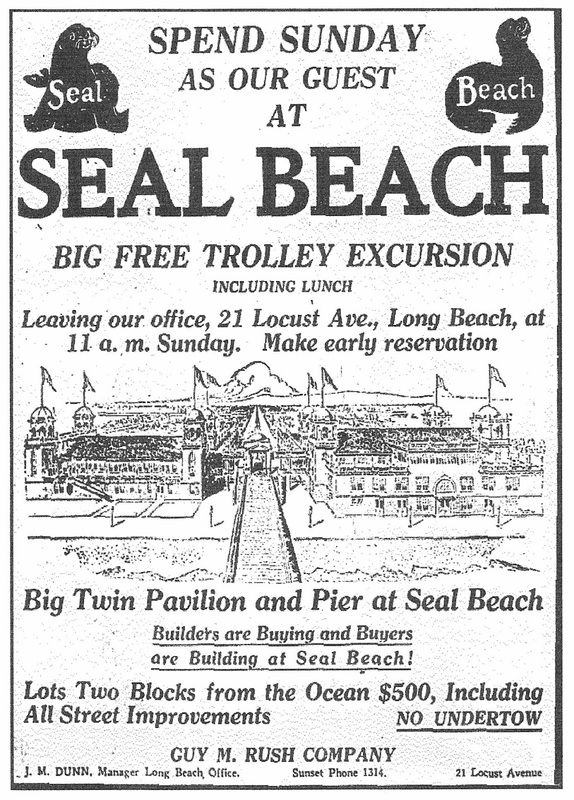 Special Pacific Electric rail cars were set aside on certain Saturday and Sundays to take visitors to Seal Beach during the winter of 1914, as the following ads indicate. "Summer is only a wink away. Get your house in order for beach time. Make ready for fun time at the beach without an undertow. Nature has given every blessing to Seal Beach. Don't wait until wise investors have snapped up all the bargains. It's paint time at Seal Beach. It's brighten-up-time at Seal Beach. It's sure-to-profit-time at Seal Beach. 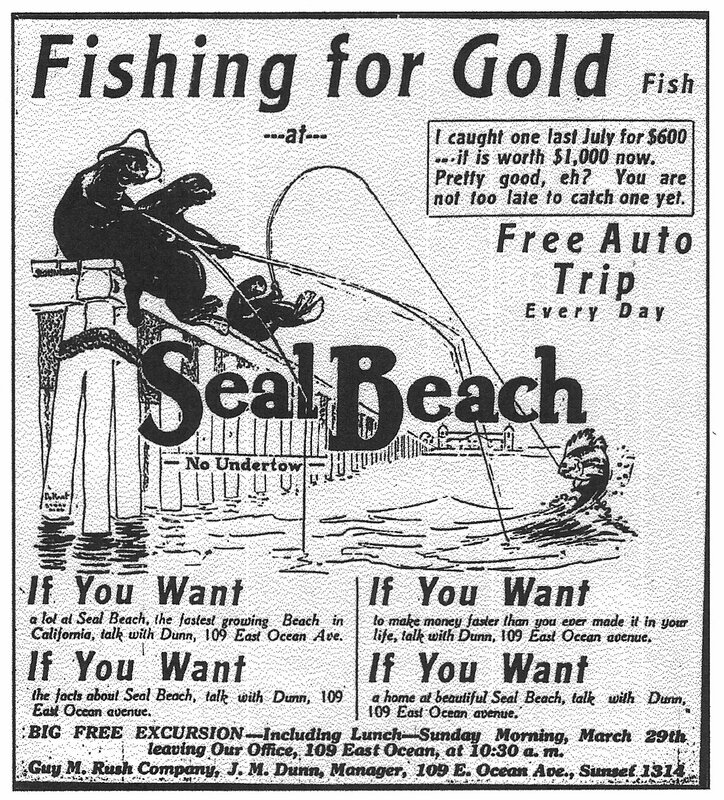 It's ought-to-buy-time at Seal Beach now..."
Seal Beach is neat as a pin. 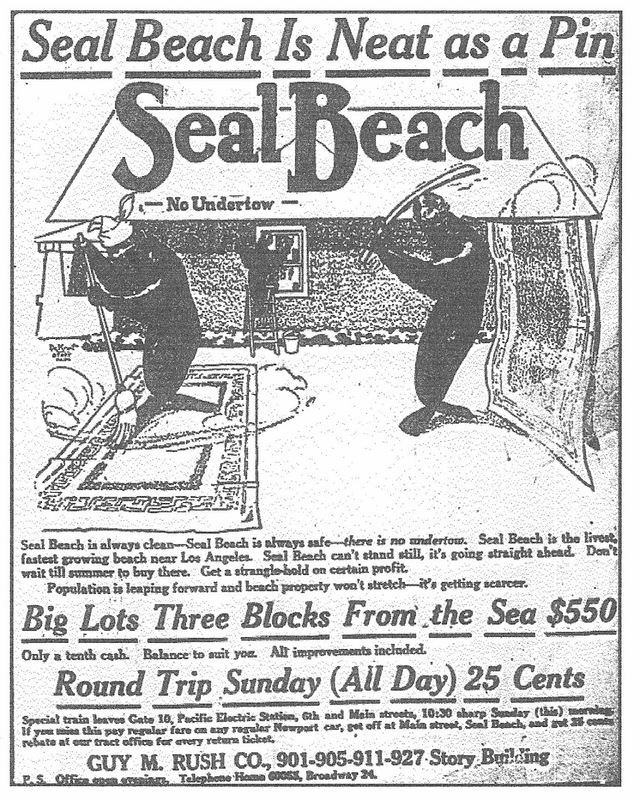 Seal Beach is always clean - Seal Beach is always safe - there is no undertow. Seal Beach is the livest, fastest growing beach near Los Angeles. Seal Beach can't stand still, it's going straight ahead. Don't wait til summer to buy there. Get a strangle-hold on certain profit. Population is leaping forward and beach property won't stretch - it's getting scarcer..."
"Landing in the right place. 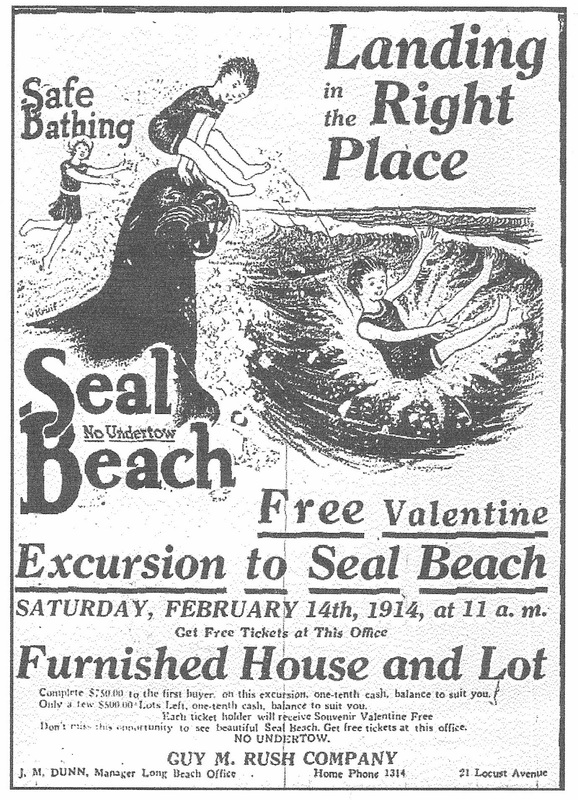 Free Valentine excursion to Seal Beach, Saturday, February 14th, 1914, at 11 a.m."
In order to promote sales in this sluggish winter season, realtors offered free trips to Seal Beach on Valentine's Day. The pretty weather is bringing quite a number of visitors to this beach where they enjoy the good air. Mr. Mills, the new manager of the pavilion is delighted with the crowds that storm the dances Saturday and Sunday and thinks there is great hope for the future. Mr. Charles Waters has succeeded in making a picture of a large number of seals on the sand, which will soon be on the market. 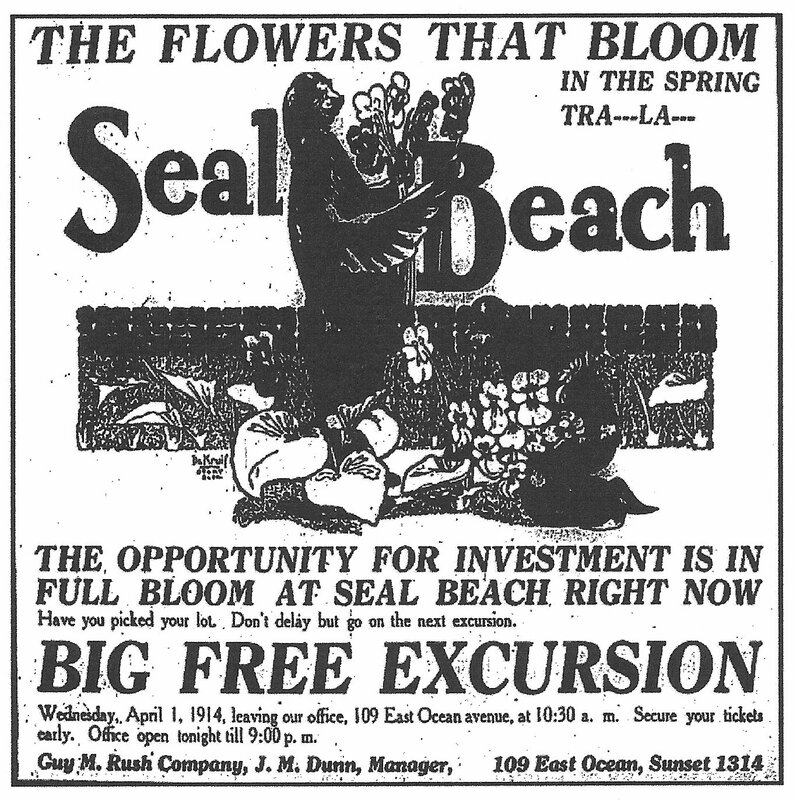 If you want the Telegram, our home paper, call at the Seal Beach Inn and you will be served with pleasure. When our school started last September we were blessed with three pupils. Now we have 47, and we will soon have a fine schoolhouse. The Bayside Land company is busy cutting all the streets through to the ocean, which will be a great improvement. Judge Ord made a good purchase on Main Street a few days ago. The judge is about the oldest citizen in Seal Beach. The amusement zone pictured in this illustration was owned by the Bayside Land Company and was popularly known as "Seal Way." Here one could find a bowling alley, billiard room, dance pavilion, ice cream parlor and much more. This entertainment zone helped Seal Beach become one of the most popular beach communities in California. However, Seal Beach depended on its closest neighbor, Long Beach, for fire protection. On August 31, 1923, the pavilion and pier were saved from total destruction by the heroic work of Long Beach firemen. A lighted cigarette started the blaze which gutted a portion of the east end of the pavilion. A shooting gallery, three storerooms, and a fortuneteller's booth were destroyed. Losses were estimated at $10,000. folks supported the Los Angeles Angels, members of the Pacific Coast League. The first work of beautifying the strand at Seal Beach as started this week when the Mercereau Construction Company began the strengthening of the pier with new pilings and general reconstruction. When this is completed, the Guy M. Rush Company, which is handling Seal Beach property, states that the pier will be put into first-class shape, with electric lights at short spaces and resting seats. All this work is to be in conformity with the proposed cement promenade that is planned to extend the full length of the waterfront at this place. The construction of the cement sidewalks and curbs, and the general improvement work on the property lying just north of the Pacific Electric is to be started next week. The heavy rains which marked the winter of 1913-1914 were not over. On February 20th Southern California experienced one of the fiercest storms in recorded history, newspapers described the flooding as "the worst flood in the history of the Southland." Back Easterners coming to the Southland for its mild winter climate were stranded for days in railroad cars, waiting for the flood waters to subside. Bridges failed, trolley service, gas, power and oil lines were out for days. Even if you wanted to get to Seal Beach, you couldn't---there just wasn't any way in, or out! In addition, slashing high tides ripped up the shore and hundred of acres of valuable farm land were washed away, silting both Anaheim and Alamitos bays. One good thing was to come out of the devastating floods of 1914---flood control. Ads were put on hold until March 8th. 22.06 inches of rain had fallen for the season, but it looked like the weather was improving---83 degrees expected in Los Angeles the day of the special excursion to Seal Beach! "Dive to briny coolness. Hot days are here! Hotter days are on the way! The hottest days are soon to come! Don't wait until July for a place to spend August and September. Don't wait until June to prepare for July. Seal Beach never sizzles. It's a cool as a cucumber all summer. 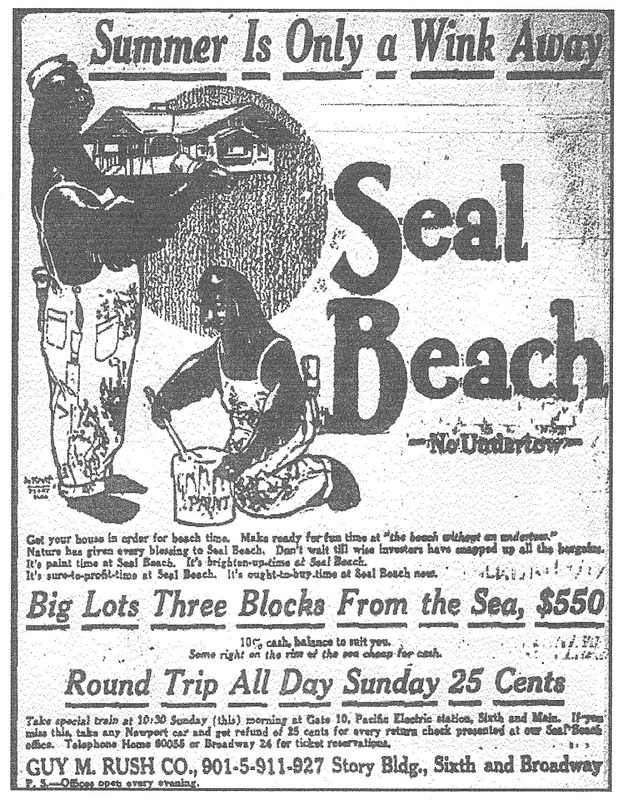 This ad stresses Seal Beach's year round temperate climate, which the seals enjoyed until 1956 when Long Beach built a marina in Alamitos Bay. The seals, not liking the noise and commotion, moved away. The Guy M. Rush Company wasn't adverse to using some of Henri DeKruif's earlier illustrations. 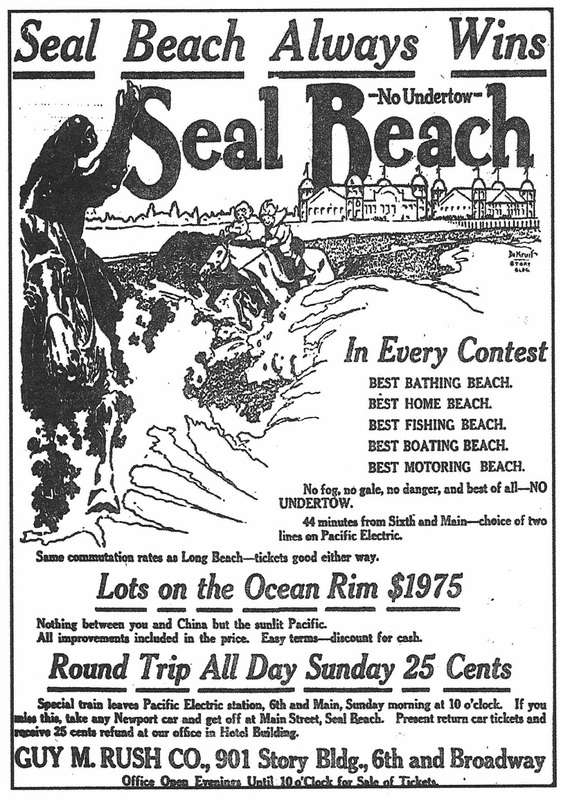 This one first appeared in the Los Angeles Times in January 1914, and was again used for Long Beach Press advertising in March. One difference with the March 21st ad, however, was the wording. With the blooming of wildflowers and trees, promoters hoped that property sales that lagged in winter would also "open up." 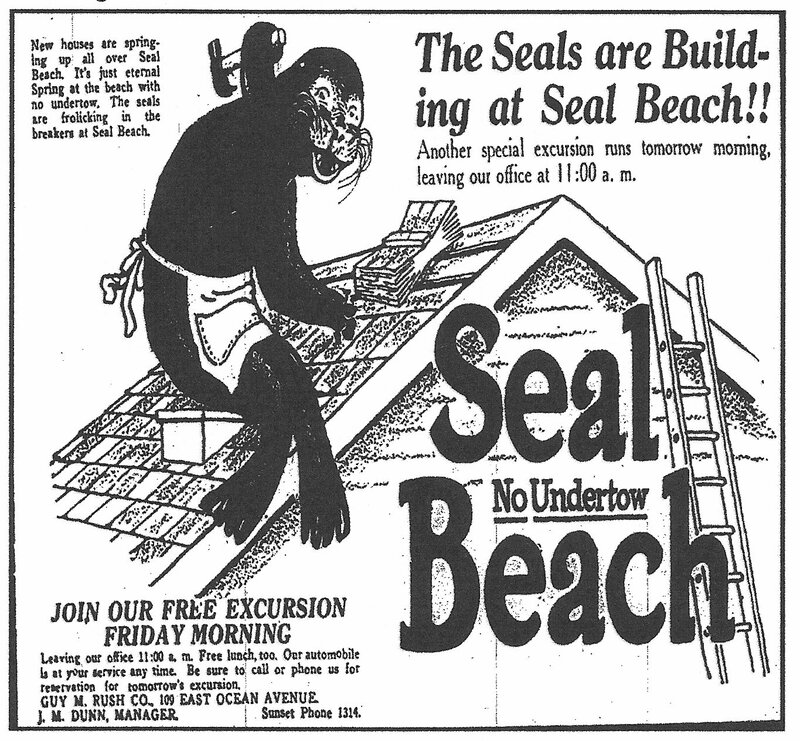 Seals are building at Seal Beach!! New houses are springing up all over Seal Beach. It's just eternal Spring at the beach with no undertow. The seals are frolicking in the breakers at Seal Beach." 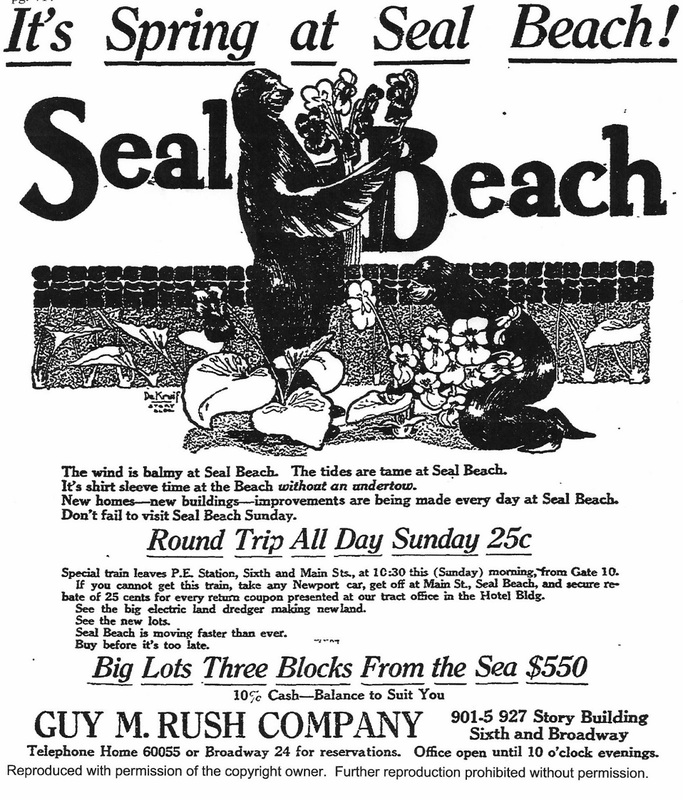 The permanent population of Seal Beach increased from 300 year-round residents in 1913 to 400 in 1914. But during the usual beach season of May-November the population jumped to 2,000. By 1923, local schools had 320 students. Two new classrooms and a kindergarten were added to the schoolhouse that year and the faculty expanded from five to eight teachers. That same year a Boy Scout troop with twenty-seven members organized, and a community hall seating 300 was added to the Methodist church to meet the needs of the rapidly growing Sunday school. In July 1957, a limited number of residential lots were placed on the market adjacent to the new $14,000,000 marina yacht basin in Alamitos Bay. Located east of Bolsa Avenue between Bay boulevard (later Seal Beach Boulevard) and Balboa Drive, prices in the Marina Shores development ranged from $5,000 to $8,357. On October 29, 1961, sales for apartments in a 541 acre retirement community known as Leisure World began. It would be the first senior citizens' development in the United States to include an insured program for medical care and drugs (excluding hospitalization) to be included in monthly rent. Both Anaheim and Alamitos bays attracted many varieties of fish. If one did not wish to fish from the pier, rowboats were available for 25 cents an hour or one dollar for the entire day. The arms of the bays extended eight miles inland along winding sloughs. Oysters and clams were so plentiful that many made a living gathering the shellfish and selling them for 25 cents a bucket. This March 29th ad shows horses on the beach. Gradually, horses were being replaced by automobiles as the favorite means of transportation. In the summer of 1913 Henry Ford set up his first auto assembly line for the Model T. He introduced a revolutionary high wage for his workers of $5 per day. Between 1909 and 1924 the price of a Model T dropped from $950 to $290. SCHOOL BONDS SOLD: Seal Beach soon to have ample educational facilities - contract let for cement sidewalk and curb. The Seal Beach school bonds, voted a short time ago by the citizens of that city, were this week sold by the Orange County Board of Supervisors to the Crown City National Bank of Pasadena. The selling of these bonds means that the new school building at Seal Beach will be under way in a short time and will be entirely completed by the opening of the fall term. Plans for the new structure are already being considered by the Supervisors. The contract for the installing of 2,000 feet of cement sidewalk and curb was let this week. the work is to be done on the south side of Ocean avenue, between Second and Main, and is to connect the new Seal Beach court with the center of town." Previously students attended classes in the Labourdette building on the southeast side of Main Street. But, as this March 1914 article indicates, residents approved a $12,000 bond measure for a new school. A frame building, faced with brick, for two school rooms and a hall between them for an office and library was ready for the 1914-1915 school year. There were two teachers, 1-4 and 5-8 grades.